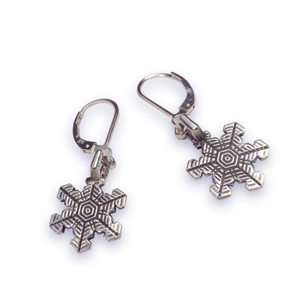 We've taken our snowflake design... and created matching, sterling silver earrings. These earrings are intricately patterned. And oxidized (darkened) to highlight the details. These matching sterling silver earrings are 1/2" in diameter. They're leverback earrings, with a jump ring to let the snowflakes sway gracefully.